I’m a fan of feel good holiday romances. For most of November and December one of my primary entertainment comfort watches are Hallmark Channel movies. 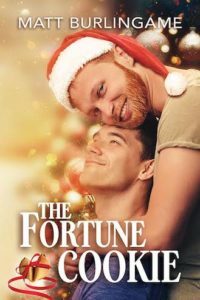 The Fortune Cookie by Matt Burlingame fits right into thie comfort category and loved this quick read that’s part of Dreamspinner Press’ Advent Calendar for 2016. Technical writer Laurence (never Larry!) is a Scrooge, completely hating the holidays. He’s got one friend, a co-worker, and over lunch one day he gets a fortune cookie that promises true love. After getting a wink from a mall Santa (very Hallmark movie! ), he ends up on an office committee to put together the annual holiday charity event. The guy running the committee is Nick, a very jolly ginger, who is quickly in over his head with how he wants to expand the event, much to the dismay of people who’ve done the event for years. Somehow Laurence finds himself attracted to Nick while he also works to save the event. This is a fairly typical transformation of a Scrooge character done really well and with two characters you really root for. Burlingame does a great job with Laurence’s transition and Nick is simply adorable. I loved this morsel of holiday goodness. Thanks, Matt Burlingame!